I grew up eating rice every night for dinner, so it has become a standard habit of mine when making rice to always make more than needed – which is great because having cooked rice on hand always comes in handy the next day when a quick breakfast is in order. I don’t really know how to categorize this; I suppose this could be considered a hybrid between a stir-fry and an omelet? Either way, it’s easy, healthy, and tasty! 1. In a medium sized skillet set over a medium flame, heat one tablespoon of olive oil, then sauté the bell peppers until they begin to soften (2-3 minutes). 2. Beat the eggs with a pinch of salt, then add to the pan. Reduce the heat to a low and scramble the eggs, turning frequently with a spatula. While the eggs are cooking, reheat the rice in the microwave for 1-2 minutes. 3. Add the rice and spinach to the pan, toss until spinach is wilted. Season to taste with pepper. 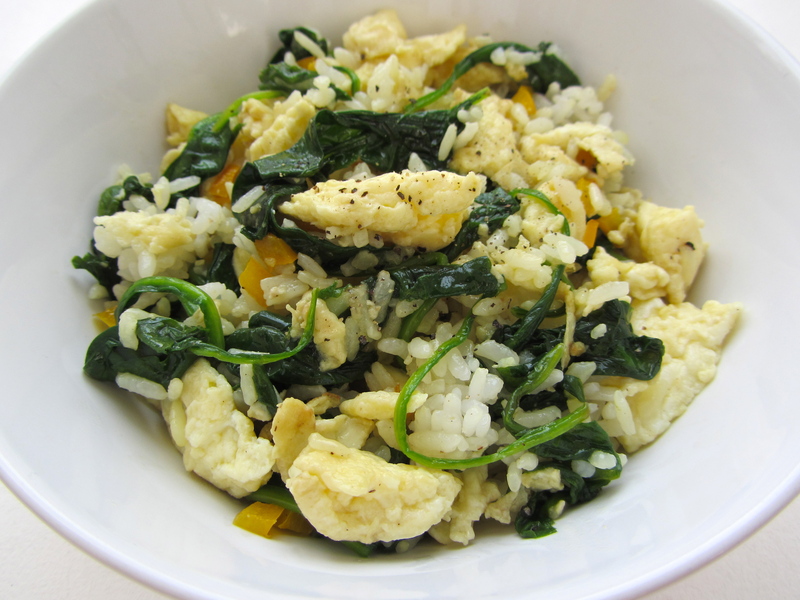 * I prefer to use a non-stick pan for this, since scrambling eggs and rice tends to stick more so than other foods.